The Elfin Diary – the only astrological diary you need! The Elfin Diary is an astrological Diary with a difference. The A6-sized softback diary, the A5-sized desk diary and the A6-sized hard-cover fully bound diary. See About the Elfin Diary for more details. This is the home of the original and only Elfin Diary – founded in 1990 and still going strong! The 2019 softback diaries and ringed hardback diaries are still in stock; go to the Elfin Diaries shop to order. Sorry, but the desk diaries and bound hardback diaries are now out of stock. 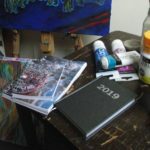 You can buy the PDF version of the 2019 Diary now. Read it on your computer, laptop, tablet, smartphone etc! Get it here. As well as diaries, you can also buy T-shirts, mugs and bags.